River Turtles. Wildlife in Bolivia. Fun Facts About Bolivian Wildlife. As of July 2007 the community of Versalles, together with park guards and in collaboration with WWF Bolivia, has been monitoring River turtles (Podocnemis expansa and Podocnemis unifilis) in the Iténez River of the protected area of the same name. This initiative is part of the local community involvement in natural resource protection activities in view of the need for conservation and sustainability regarding species. The most interesting aspect of this project is that the community itself took on the initiative in direct coordination with the park guards of the Iténez Protected Area (PA). Six community members became responsible for monitoring river turtle nesting sites on four beaches on the Iténez and San Simón rivers. To determine the conservation state of the river turtles, local technical staff used a diagnosis regarding the use of local communities of these resources and, in this way, be able to identify current threats to the river turtle populations. The work carried out by the volunteer community members consists in obtaining information that can be used as input for the future development of a Turtle management plan for the northern area of the Iténez PA, as well as surveillance activities during the nesting and egg laying season. The Giant South American turtle (Podocnemis expansa) is classified as “lower risk/conservation dependent” (LR/cd) on the IUCN Red List 2003, and listed under Appendix II (which means the species is not necessarily currently threatened with extinction, but may become so unless trade is closely controlled) of CITES (Convention on International Trade in Endangered Species of Wild Fauna and Flora) – and the Yellow-headed sideneck turtle (Podocnemis unifilis) is classified as “vulnerable” by IUCN, and is also listed under Appendix II of CITES. The main causes for the reduction in their populations in other areas in the lowlands of Bolivia is indiscriminate hunting for commercial purposes, as well as the excessive consumption of their eggs, the logging and clearing of areas surrounding rivers, and damming of rivers, which can cause the water cycle to be drastically altered. This can confuse the turtles' natural seasonal cycle of nesting, which is timed to the alternation of floods and low flows. In addition, premature rising of rivers can flood nesting sites, causing reduced hatching success. Both species are considered crucial for maintaining the biodiversity within their habitats, due to their important role as dispersers of fruits and seeds, and these Turtles hold third place in fulfilling this role after monkeys and birds (Conway, 2004). The Giant South American turtle (Podocnemis expansa) belongs to the Podocnemidae family and is the largest river turtle in the Amazon and Orinoquia. Females measure between 70 cm up to 1 m and males range from 30 to 55 cm. The females lay 150 to 180 eggs once a year and the incubation period is roughly 45 days. This primarily herbivorous species feeds predominantly on the fruits of riparian trees. Leaves and stems are also taken, as are freshwater sponges and occasional insects or carrion. The Yellow-headed sideneck turtle (Podocnemis unifilis) also belongs to the Podocnemidae family and lives in the Amazon and Orinoquia rivers. The female is larger than the male, and its tail is shorter and wider. Females can reach a size of 35 to 68 cm long and weigh more than 8 kg as adults. It feeds on vegetable matter: grasses, fruits, leaves, carrion and mollusks. 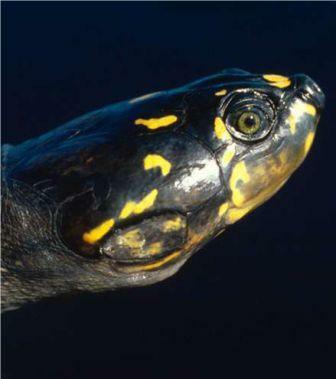 The Yellow-headed sideneck turtle lays 10 to 35 eggs twice a year on sandy beaches along rivers. This occurs during the dry season and helps impeding the eggs from being carried away by flooding. The eggs hatch in roughly 60 to 80 days. The greatest threat to both species (Podocnemis unifilis and Podocnemis expansa) is the illegal harvesting of eggs on behalf of some fishermen and communities, who then either eat or sell them. 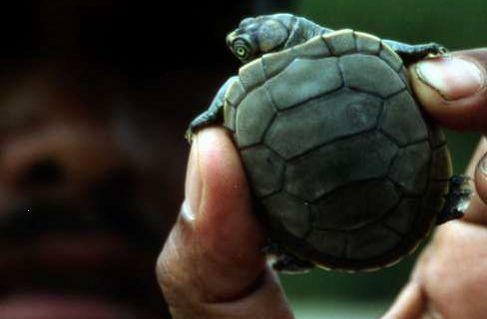 Hatchlings are also sold in the illegal pet trade.